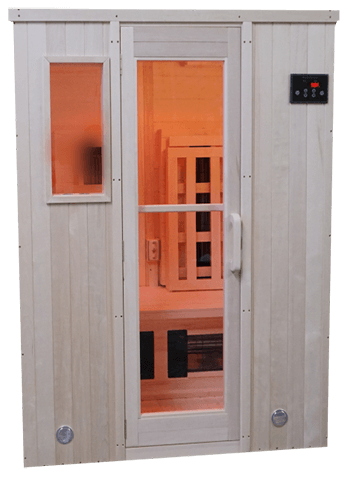 The Original far-infrared sauna since 1987. Built with your health in mind. Suitable for even chemically-sensitive individuals. Throughout history, people have been sauna bathing for health and vitality. It is really important to take saunas for many reasons. First of all, it provides your own private space to take time out for yourself to relax and unwind from the days’ stresses. Saunas, especially far-infrared ones provide a safe, lower temperature and deep penetrating heat that has numerous benefits. It can loosen up old fat deposits lodged under the skin. Many toxins are stored in the fat cells so the more fat that is excreted the more toxins, impurities and heavy metals are excreted as well. When you sweat it stimulates the sebaceous or fat glands and leaves your skin almost as soft and smooth as a baby’s bottom. It increases nitric oxide in the body, helps to relieve body pain including sore muscles and also burns calories. Sauna bathing increases blood circulation so it’s especially beneficial for someone who is unable to exercise. 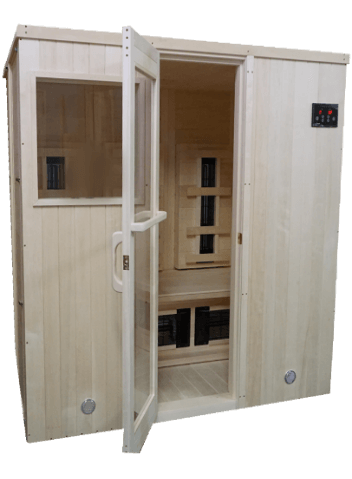 The Heavenly Heat Sauna is handcrafted in the USA and is designed with your health in mind. 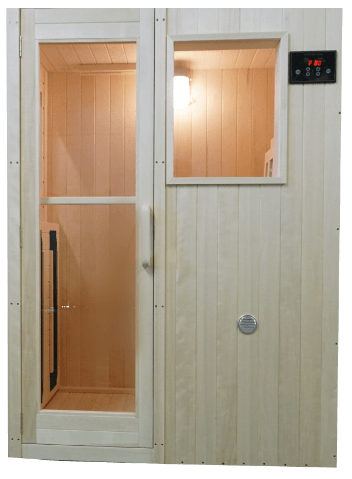 This sauna is suitable for even the most chemically sensitive persons because it is built completely free of toxic building materials. The white poplar wood is custom milled and untreated; there are no wood glues or varnishes at all used in the sauna. It just makes you feel so good! The far-infrared models plug into a regular household 110V outlet and do not require any additional wiring or plumbing. It’s easy to set up as well. It will provide many years of enjoyment and will help keep you on the road to optimal health and vitality! Built without wood glue, varnish, plywood, or any similar materials. Untreated white poplar wood is used for all wooden parts, including concealed framing. The frames are made of thick hardwood secured by steel screws rather than nails and glue. All windows are made of strong heat-tempered glass. Window gaskets are custom-milled poplar wood rather than synthetics. Lights are made of plain metal and glass. “Gadgets” like CD players and ionizers are deliberately excluded to limit synthetics. Wall-mounted heaters are ventilated to provide an automatic, constant air-change. Heaters are tested to assure low electromagnetic fields (EMF). Each heater is dual grounded. Wall-connecting latches are stainless steel. Personal sauna that surrounds the bather with 6 ceramic far infrared heaters for full exposure. All 3 upper body heaters have intensity-controls; seat is extra deep; footrest for comfort and 2 windows. Plugs into a standard, grounded, 15 – amp, 110 V outlet. Glass reading light included. 2 person sauna with 7 heaters. Plugs into a 20-amp, 110 V outlet. Options such as speakers or casters can be added to all models. Heaters are conveniently placed at the lower leg area, back and on the sides of the sauna. 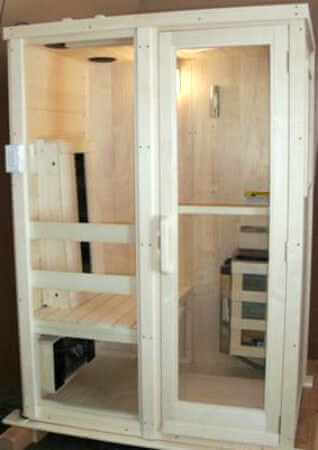 3 person sauna with 8 far infrared heaters. Plugs into 20-amp, 120 V outlet. 5′ 7″ long bench allows one person to recline depending on the person’s height. Heaters are conveniently placed at the lower leg area, back, and on the sides of the sauna. Caster wheel option is perfect for this unit to easily move from one area to another. FIR 3 48″ x 71″ (8 heaters) $4800, plus shipping. You can add a far infrared (FIR) heated backrest to this sauna for deeper penetrating heat. Far Infrared heating with a stainless steel Finnish heater. Use either dry or add water to create light steam. There are four FIR heaters in this unit. Dr. Jacqueline Krohn, Dr. Doris Rapp, Brenda Brown, Dr. Mark Schauss, Carolyn Gorman, Dr. Nenah Sylver, Dr. Pamela Reed Gibson, Dr. Larry Wilson, Dr. Marianne Marchese, Dr. Nicola McFadzean, Dr. Jerry Kartzinel, Jenny McCarthy, & Marilyn McKiver. Our saunas have been recommended by: Dr. Julie Buckley, Dr. Larry Kaplan, Dr. Nancy White, Dr. Anju Usman, Dr. Tipu Sultan, Dr. Eric Sletten, Dr. Nancy O’Hara, Dr. Andrew Levinson, Dr. William Rea, Dr. Kalpana Patel, Dr. Allan Lieberman, Dr. Grace Ziem, Dr. Constantine Kotsanis, Dr. Steven Harris, Dr. Daniel Newman, Dr. Gerald Natzke, Dr. David Buscher, Generation Rescue, Dr. Leslie Charles, Dr. Timothy Callaghan, Dr. Jeremy Baptist, Dr. Dietrich Klinghardt, and many other healthcare professionals. GL: Standard glass (# of walls with windows); GL Option: modify the glass (no charge). In A+, M1 & M2: GL2 can be a glass front and either side or glass on the front half of the sauna. RB: FIR backrest. S: exterior sealant. STD = standard for that model. Sizes are exterior, depth by width. M heights are 6’5”; others: 6’. **NIR: ceiling heat lamp: $200. XIR: FIR under-seat @ $100. L: a light in models with GL2-4: $75. All GL1’s & FIR models have lights. SND: Speakers: $100. (standard in FIR2DX). A: an extra air filter: $25. C: casters; in M’s: $200. ; in smaller models: $100. Shipping to the continental U.S. $250 models A, A+, FIR 1 & 2. $350 models M1, FIR 3 & 4. $450 M2 & M3. Add $150 to ship to Canada. Add $350 to Hawaii and Alaska. For all other locations, please call for a quote. When you order a Heavenly Heat Sauna through us, we will send you four candles FREE from the Natural Candle collection. This is a value of over $100. These candles will ship separately from California. 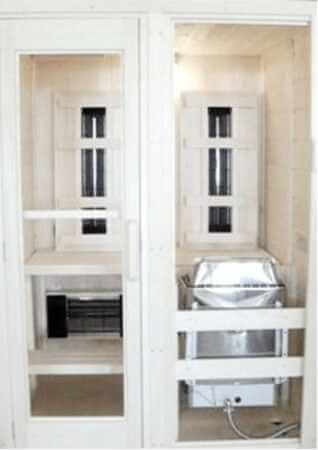 Each sauna is made to order in Arizona and takes 3-6 weeks until ship date. It feels so good sitting in the Heavenly Heat Sauna, especially knowing I’m detoxifying. And best of all, it leaves my skin so soft and smooth. – Karen L.